In an ancient tomb is buried a magical lamp. Click here to play! It is said that a person can summon a powerful genie by simply rubbing this lamp and saying the magic words 'I love big slots wins'. The truth of the matter is a bit more complex, so allow me to tell you how the genie can be called upon. In a seemingly nondescript part of the deserts of the Internet, there lie online casinos that will tempt you with great fortunes. 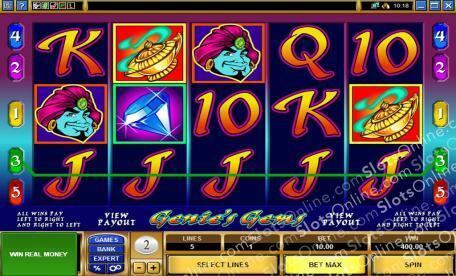 If you enter the right one, a certain slots game called Genie's Gems will call to you. It will feature familiar symbols, such as poker ranks, as well as special ones, like magic carpets, temples, blue gems, magic lamps, and the genie himself! To call on the genie, you will need to line up 5 of those symbols on a payline. He will then grant you your greatest wish - a 10,000 coin jackpot! Hurry to the Genie's Gems slots now, before others discover the secret of summoning the genie and try to make the journey themselves!